Two rare Kashmiri painting collected by David J. F. Newall in 1850s and presented in his book 'The Highlands of India' (1882) and Preliminary Sketches in Cashmere; Or, Scenes in "Cuckoo-cloudland." By (D.J.F. Newall.) [With Illustrations.] (1882). 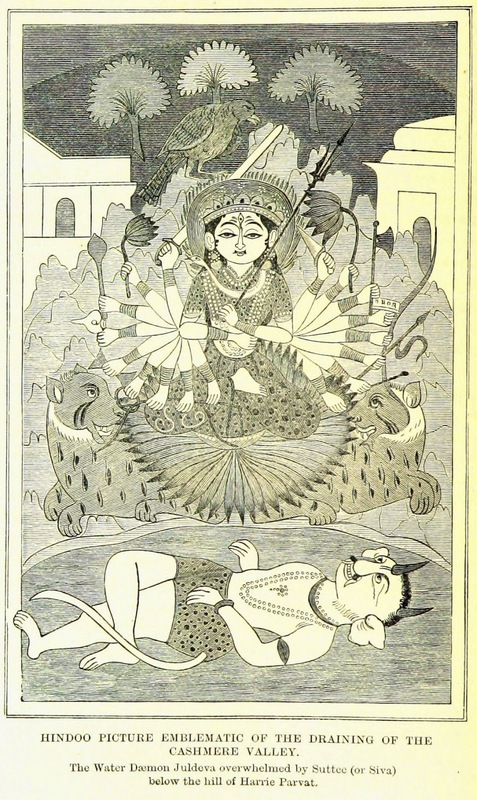 The Water Demon Juldeva overwhelmed by Suttee (or Siva) below the hill of Harrie Parvat"
In the story, the goddess Sharika [Tripursundari] kill the demon Jalodbhava by taking the form of a Myna (Haer in Kashmir, hence the name of the hill. 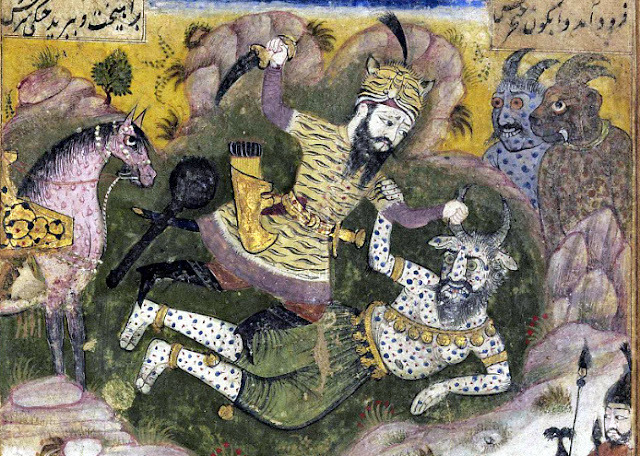 Identifiable in the painting) and dropping a pebble on the head of the demon (hence setting the precedent for stone throwing in Kashmir). The stone depicting the goddess on Hari Parbat. 2008. 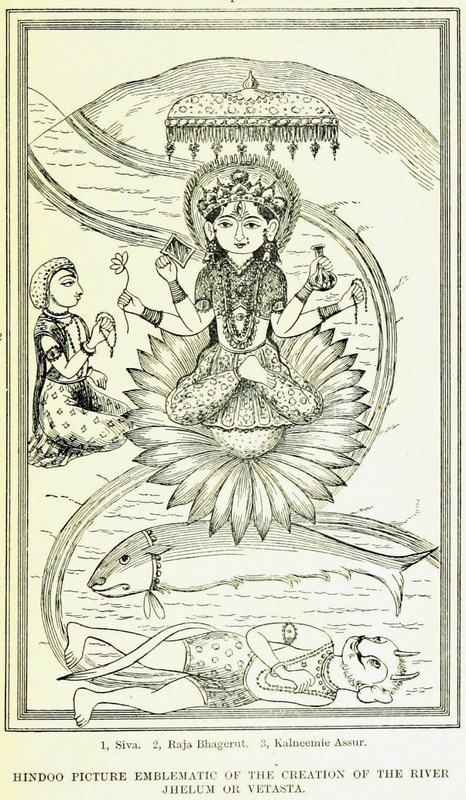 "Hindoo Picture emblematic of the creation of the river Jhelum or Vetasta." I now come to the last pilgrimage of which I Have noted the details, and which may perhaps be almost more properly called a fabulous account of the river Vetusta, as I am not aware that it is at any time undertaken by the Hindus of Cashmere, and as I rather think that some of the places named are under waters of that river. I extract exactly as I find it in my notes. 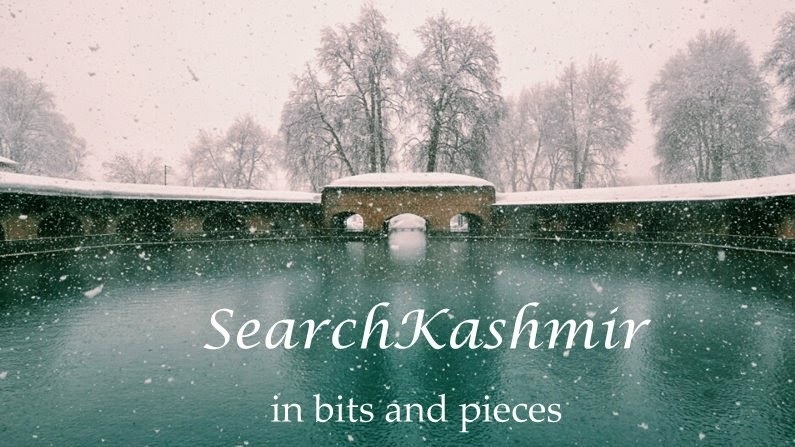 "Fabulous account of the origin of the river Jhelum or Vetusta." "Mahadeo being here engaged in self-contemplation, Raja Bhagerut arrived, and prayed for a Nag or spring in which to bathe and be cleansed from his sins. A stream then issued from the head of the destroyed which, on arriving at Wamoo, was swallowed by a certain demon, rejoicing in the name of Kalneemie Assur. A second spring was in like hammer swallowed by the thirsty demon. Whereupon Raja Bhagerut descended from his place of prayer at Vetusta Khoond, and engaged the demon, whom, after a brisk encounter (described in the graphic language of the Sanskrit ring (sic in MS.) he is stated to have injured, but was unable to destroy or drive away. (Kalneemie Assur probably graduated in the Vedic art of self-defence!) In fact it seems a polite way of stating that the Raja got the worst of it, as the demon is stated to have given chase, and to have come as far as Hurnag (Virnag) in pursuit. At this however, the wrath of the destroyer was aroused. He encountered the demon, and slew him, got his head in chancery and finally grassed him. I have in my possession a picture of this event where Mahadeo is represented as literally sitting on his face! Lion (or Mahdeo) then commanded the spring to follow Bhagirat Raja, who, descending the valley, passed successively. 10. 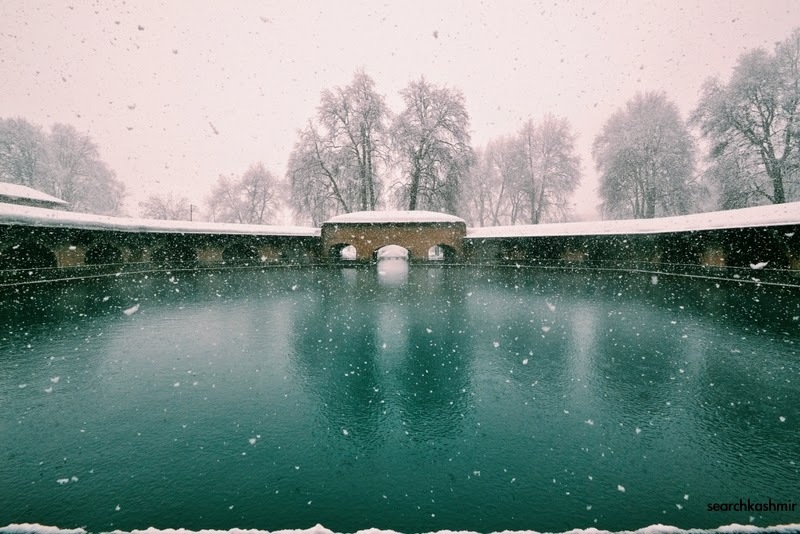 Baramoola, the residence of Raja Bhagerur, where the pilgrimage terminates." Newall had no knowledge of Sanskrit, in fact the story was narrated to him by his source in Persian reading from a Sanskrit Manuscript. Kalanemi, a very popular demon from Vaishnav stories, a perennial enemy of Vishnu, even Kansa is said to be a incarnation of Kalanemi. The story of birth of Vitasta seems to draw upon the stories of birth of Ganga (the reference to Raja Bhaghirath) and slaying of Kalanemi by Vishnu/Shiva in multiple puranas. 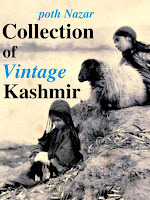 The imagery of the demon was uniform in Kashmiri style irrespective of story from which culture was being drawn. From Newall's writings it is clear that he had collected a lot more of such paintings but sadly only these two seem to have been published. 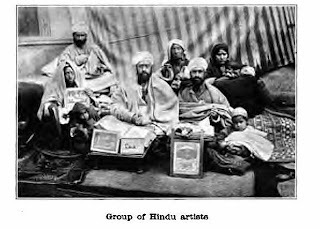 'Group of Hindu artist' from ‘Afoot Through the Kashmir Valleys’ (1901) by Marion Doughty.